Thirsties (Original) Diaper Cover in snap closures is a true-sized diaper cover. Made in USA. The Snap version on this page. The Hook and Loop version is here. Don't confuse this sized cover with the Duo Wrap. This one does NOT have snap rise adjustments. This is a true sized cover which comes in sizes XS through Large. The size LARGE of this Thirsties Cover is larger than the Thirsties Duo Wrap size 2. A true-size diaper cover with snap closure. What is "true-size"? True-size or sized means that it comes in each size, XS, Small, Medium and Large. Unlike an adjustable rise cover or a one-size-fits-all cover, it doesn't have rise snaps, Not everyone likes the bumpy rise snaps on the front of adjustable covers, nor the bulk of the cover fabric in front when the rise is snapped down. This cover is sized so it is made to fit the actual size without rise adjustments. No cover bulk up front! The shape of the cover is not the same as the Thirsties Duo Wrap. It is roomier inside. Don't size up with this cover because it is generously sized. The XS cover is really nice over newborn fitted diapers. It is too big on small newborns, though. The waist does still adjust since there are many waist snap selections to choose from. I find that not having rise snaps on the front does have an advantage for me when I hold the baby next to my body. It is more comfortable for me. I also think that true-size covers such as this are a bit less confusing for caregivers. It has gentle leg gussets and exposed laminate inside, also known as a wipe-clean interior.100% polyester with TPU laminate. FREE of VOCs, PVC, phthalates, lead, and latex. 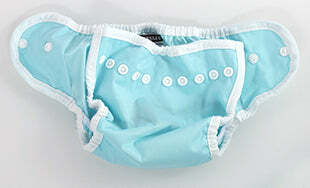 Another quality CPSIA-compliant, made in the USA diaper cover choice from Thristies. The size Large is a big cover. If baby has outgrown the Thirsties Duo size 2, the size Large Thirsties Diaper Cover is the next size up after the Duo size 2. It is also a good nighttime diaper cover because it is roomy enough inside for extra doublers. Small pictured. Very adjustable waist and it has leg gussets. Size Medium cover with size medium red edge prefold. The prefold lays right in there at full length without folding it down easily. This is a roomy cover. Great for pinning or Snappi fastening. The size Medium fits over the size large Workhorse. Small will fit over small or medium Workhorse. XS works with newborn or small Workhorse. XL Workhorse will work under either the medium or the large cover but I prefer it under the large cover but it depends on the baby's shape. What works with what is variable depending on baby's shape and your preferences for how you like things to fit. Give pinning a try! It really works. I love the snaps! I have used velcro for 3 kiddos and it has finally worn out and has become a big issue to fix. Snaps are the WAY to GO! Getting the actual sized diaper for my big two year old stopped leaks at night time! I'm very happy with the product and my purchase. I started out buying 6 Duo Wraps to get the bulk discount, but decided at the last minute to get a Diaper Cover for nighttime use. I'm new to cloth diapering and didn't know the difference between the Thirsties Duo Wrap and Diaper Cover, but I read about the difference recently and things started clicking into place in my head. We had a hard time with night time leaks until my sister-in-law introduced us to the Workhorse by Cloth-eez. Those in combination with the Thirsties cover are a perfect nighttime solution for us. 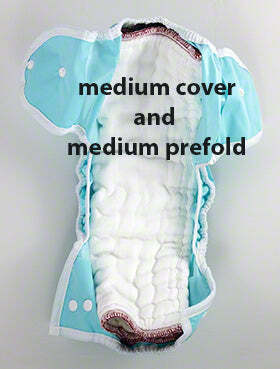 I would definitely recommend using a fitted diaper or using a fastener if you use prefold diapers with this cover. We use these over our Workhorse snap diapers. I love the two together. Both are great!! Thirsties covers are the best! Love thirsties covers. To be fair, we have only had one cover of a different brand, but these covers are fantastic. We preferred the velcro closure when baby was under 1 year, easier to use and able to get a better fit. Snaps have become necessary now that she loves playing with velcro.